Science fiction meets real-world technology in Doctor Geek’s Laboratory, Season 1 It’s the twenty-first century—have you ever wondered what happened to all those inventions, conveniences, and other concepts the future was supposed to bring? 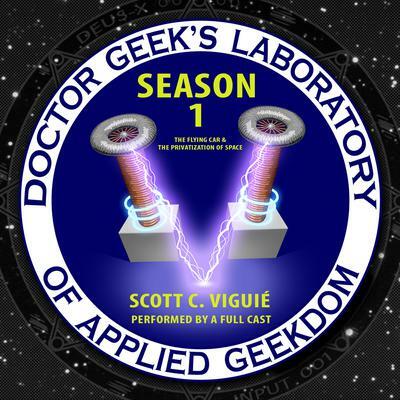 Doctor Geek’s Laboratory, Season 1 explores all the realms of applied geekdom, examining the future that was, the future that is, and the future that has not yet come to pass. Dr. Scott Viguié created Doctor Geek’s Laboratory as an outreach to explore the exciting possibilities of science, technology, engineering, and mathematics in the hope of bringing people closer to the scientists, inventors, entrepreneurs, tinkerers, and others who are attempting to bring about the world of tomorrow. Together we will help the future along—and give it a little push when needed. It’s the twenty-first century—have you ever wondered what happened to all those inventions, conveniences, and other concepts the future was supposed to bring? Doctor Geek’s Laboratory, Season 1 explores all the realms of applied geekdom, examining the future that was, the future that is, and the future that has not yet come to pass. Dr. Scott Viguié created Doctor Geek’s Laboratory as an outreach to explore the exciting possibilities of science, technology, engineering, and mathematics in the hope of bringing people closer to the scientists, inventors, entrepreneurs, tinkerers, and others who are attempting to bring about the world of tomorrow. Together we will help the future along—and give it a little push when needed.